Summer will be here before you know it. Here's how to find the best Los Angeles Summer Camp for you. You live in L.A. and you're looking for a summer camp. You know L.A. has a wide variety of super fun program opportunities for your child, and of course you want to choose the very best ones. No use sending your child to a camp they won't love. But how do you find the best one? To our way of thinking, the first order of business is to decide what the "best camp" actually means to you or, in other words, what kinds of programs, activities and qualities are most important to you in a children's summer program. Everyone's different, so it stands to reason each of us will use our own specific criteria to determine what comprises the best camp for them. One family might feel the best camp is one that takes place just down the street so they can always be in close proximity to their kids. Another family might feel the best camp is the one that offers the most discounts, and so on. What Does the "Best" of Anything Mean to You? Each of us has unique tastes and a variety of different interests in all aspects of life from food to airlines to sports teams, you name it. That means there's really no right or wrong way to identify the best of anything since it all depends on your own personal feelings, choice, experiences and opinion. If you're an L.A. Rams fan but I prefer the L.A. Chargers, each of us might say our team is the best. And that's just the way it should be! ​Whatever you personally feel is the best fruit, airline, hiking trail, pizza joint, or anything else, then that particular thing is the best for you, period, because your feelings are the truth. Take the example of the "best fruit." Strawberries are my favorite , so naturally I'd say strawberries are the best. But if your favorite fruit is watermelon, then watermelon's the best fruit according to you. Both of us are right because it's a personal choice; nobody else gets to decide what the best fruit is for us. Here's another example -- an experiment you can try. Next time you're on Facebook, ask your friends for a recommendation. Post something like this: "I looking for a dentist in my part of Los Angeles. Can anyone recommend one?" "Try Dr. Smith! We've been seeing her for 20 years. She's the best!" Dr. Felix is the BEST! He fixed my son's broken tooth in 10 minutes! Wouldn't go anywhere else!" As the recommendations come in, everyone will tell you their dentist is the best. This same exact experiment will work for any recommendation you ask for be it a camp, restaurant, amusement park, anything. ​ ​I remember Andy Rooney of 60 Minutes once said, "One of the best things about dogs is that everyone thinks theirs dog is the best." He's right. ​The reason why everyone has different viewpoints as to what's the best of anything is because we all have our own unique feelings and opinions which have been formed based on personal experiences. In the end, your should use your own personal criteria to decide what you consider to be the "best" of anything for you. Few decisions you'll make as a parent will contribute to your child's happiness more than finding a summer camp they'll love. In the right camp environment, the friends they'll make and experiences they'll share have the potential to become some of the most meaningful of your child's life forever. That's why it's so important to find "the best camp for you." ​Remember, everyone has different feelings and opinions as to what constitutes the best camp, so whatever you decide is best for you, we're all for! But as long as we're talking about what traits make up the best summer camps in L.A. (or anywhere else for that matter), we thought we'd share our opinion and, actually, it's very easy to understand. Plain and simple, the best camp for your child this summer is the one which offers programs and activities that interests them. For example, let's say your child absolutely loves the ocean and marine life and wants to lean more about them. In that case, sending your child to summer camp at Sea World would be the best experience ever! 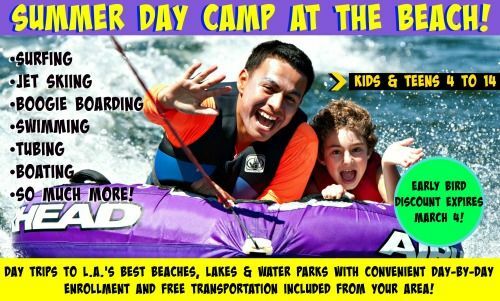 Conversely, ignoring your child's requests for a camp like this and sending him to a cooking camp here in L.A. after he's been looking forward to an aquatic camp experience might not be a favorable choice. In that case you're setting him up for a less than meaningful camp experience, especially if he doesn't like cooking. Now let's look at this from your next door neighbor's point of view. Let's say your neighbor has a child who can't wait to go to cooking camp this summer. From that family's standpoint, cooking camp is the best camp ever. So you can see how everything comes back to each child's unique tastes, interests and opinions. Summer camp is a personal experience for kids. The cooking camp and the Sea World camp are both probably great programs, but only for those particular kids who enjoy those specific types of activities and have those specific interests. Finding a summer program with an program theme or activity focus that appeals to your son or daughter is the ideal way to find the best camp for them. The most efficient way to start your camp search is through your own due diligence. Researching as many camps and programs as you can, then narrowing down the list to a select few that interest you and your child the most, is a great path to follow. But the thought of contacting each camp one by one is daunting! Who's got extra time to spend calling one camp after another, day after day, then sorting through the various options until you finally have a short list of camps that match your interest? Certainly not you -- you're too busy for that! So what can you do to save time and still be sure you're picking the best camp? 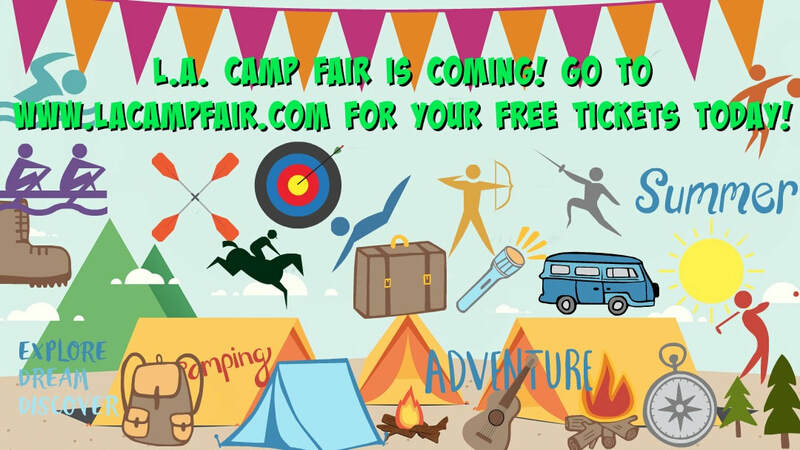 ​Attend the L.A. Camp Fair! Savvy parents know attending an Camp Fair is the ideal way find the best summer camp for their kids. At a camp fair, dozens of camps come together all in one place to exhibit their programs for your educational benefit. If you're unfamiliar with a Camp Fair, it's basically just like an expo where dozens of camps are stationed side-by-side in a booth-like setting and you can walk through the aisles visiting each one. Attending a Camp Fair is a great way to get a "personal feel" for each camp because each booth is staffed with actual representatives (usually camp counselors and directors) from all the camps, which provide a great opportunity for you to meet all the staff, ask questions, and learn about all the various program opportunities available to your kids this summer. With such a wide variety of programs to consider, meeting and compare all of them in one place is a lot better than spending weeks at a time contacting them individually. That's the benefit of visiting a Camp Fair! Where is the L.A. Summer Camp Fair Being Held? L.A. Camp Fair 2018 is actually encompasses three different events at three different venues in March and April this year. The first event takes place at UCLA on Sunday, March 11. The next event takes place in Thousand Oaks at Conejo Creek North Park on Saturday, April 14. And the third and final event takes place at A.C. Stelle Middle School in Calabasas on Sunday, April 22. You are welcome to attend either one, two or all three camp fairs, whatever your choice or preference. There will be over 60 camps attending each Camp Fair, and some of the camps are only attending one or two, so in order to make sure you see every available program, consider attending all three. Every kind you can imagine. We're talking beach camps, debate camps, traditional day and sleepaway camps, girls-only music camps, Hawaii science camps for teens and so many more. And that's another benefit of coming to the L.A. Camp Fair -- you'll be blown away not just by the sheer number of programs participating, but also by the incredible variety of available types of summer program opportunities available to your kids. 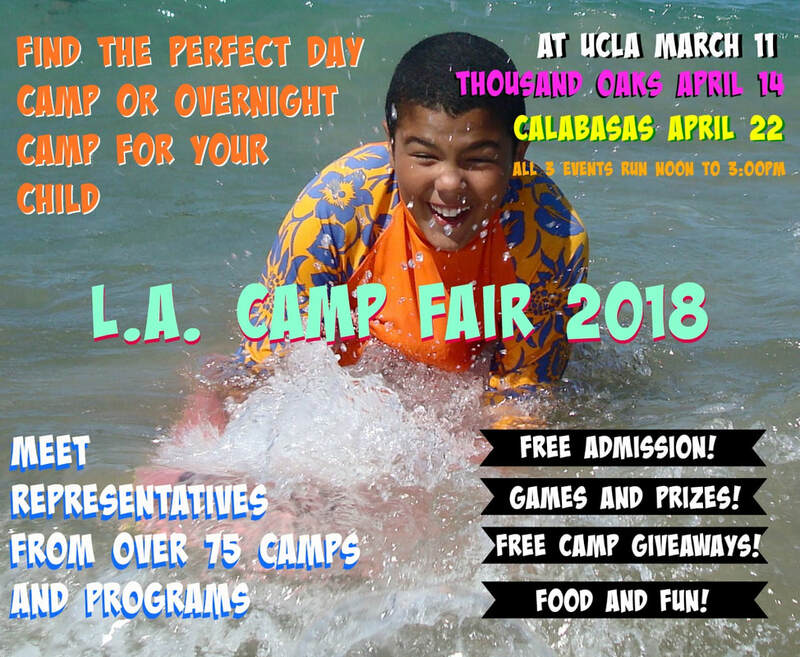 Will Only Los Angeles Camps Be at the Camp Fair? Not at all! 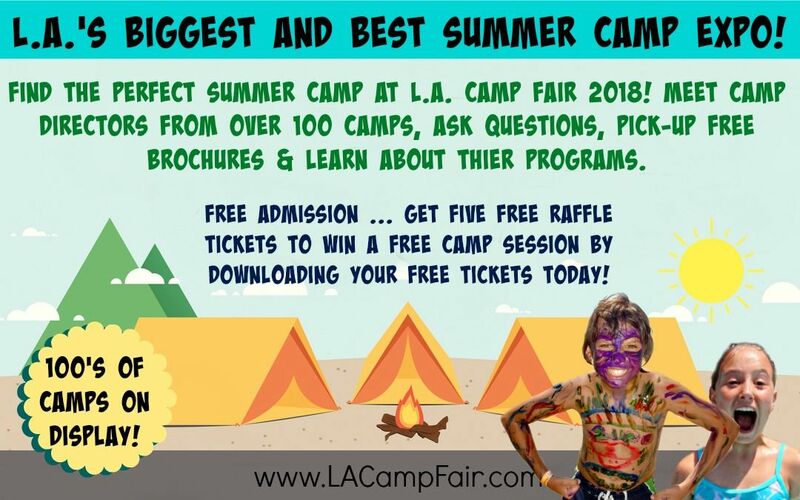 Even though the prevailing thought among parents is the Camp Fairs feature only local programs, the L.A. Camp Fair will feature camps from everywhere. The best way to understand it is like this: even though Camp Fairs are local events, the camps and programs exhibiting at them aren't exclusively local programs. With over 60 camps attending each Camp Fair event, you can best sure some of the absolute best camps in L.A. will be on display. At the same time, many camps from out of state and elsewhere are participating too, so if you're considering a sleepaway camp in New Hampshire this summer, you'll find it at the L.A. Camp Fair. Hopefully by now you're convinced what a great opportunity attending the Los Angeles Camp Fair would be! All the best Los Angeles summer day camps and sleepaway camps for kids of all ages will be there, not to mention camps from other parts of the country, too. It's the easy way to parents to meet camp professionals from all kinds of programs and sort through all the incredible summer camp options available to your kids this summer. There will be lots of games, fun and activities for the kids too, and just by grabbing your free tickets to the Camp Fair right now, you can automatically get five free raffle tickets to win a free camp session from one of the participating camps. And if you win a free camp session, suddenly THAT camp might seem to be the best! Get your free ticket now and we'll see you at the L.A. Camp Fair at UCLA, Thousand Oaks or Calabasas as you meet and interact with dozens and dozens of camp directors all in one place.